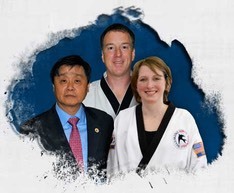 Grandmaster Dong’s Martial Arts School in Morehead City provides the beginner karate program, taught by Instructor George Craft, at the Cape Carteret Aquatic & Wellness Center and the Western Park Community Center in Cedar Point. The Morehead City main location offers more than 30 day and evening classes each week for all experience levels - ages 4 through adult. The school is owned by Phillip and Shannon Henry and is one of more than 30 schools in the USA, Australia teaching Grandmaster Dong's system. Master Phillip Henry is a 5th degree black belt in three styles of Korean Martial Arts, a certified personal trainer and a Youth Exercise Specialist. Master Henry has weekly, personal contact with Grandmaster Dong and passes this knowledge directly to his students to ensure the quality and authenticity of the program. Grandmaster Seung Gyoo Dong studied several styles of martial arts including Tae Kwon Do, Hap Ki Do, Ta Kyuk Do, and Kum Do (sword). He also served as the Korean Air Force headquarters instructor in 1967. Grandmaster Dong moved to America to continue his college education and opened his first school in Virginia in 1971 and gained world recognition when he was featured on the cover of Tae Kwon Do Times magazine in 1989. An author of four books, Progressive Sparring, Sparring Structure, Where is My Black Belt? and Martial Arts Mastery: Evolution of Training released in 2015. He also has a six-video series which includes all the color belt requirements and the advanced black belt video series, Progressive Sparring I and II. Grandmaster Dong still teaches daily at the Headquarters branch in Richmond, VA and has successfully trained more than 7,000 black belts in his martial arts career, including over 50 masters and several world champions.